Everyday Fashion and Finance: Max and Chloe Giveaway! Hello friends! Happy Monday! I hope everyone had a fantastic Fourth of July! I feel like I have been out of the loop forever. I did some serious unplugging while at the lake house. It wasn't entirely intentional, but it just sort of happened. I rarely used my phone, and I never turned on my computer (work or personal). It was probably needed. It was also quite glorious. The beginning half of last week was spent putting the finishing touches on the lake house (pictures coming soon). Then, during second half of the week, we hosted a few friends and family. We spent our days boating and grilling, and our nights by the bonfire. On Saturday night, we took the boat out to watch the fireworks on the lake. Definitely one of the highlights of the week. 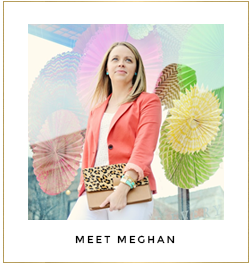 In true blogger fashion, I packed a ton of cute clothes for the week, but I did not wear most of them. I spent my days in a bathing suit and cover-up, and my evenings in comfy clothes by the fire. Of the five pairs of shoes I brought, I basically only wore flip flops. I let my hair air dry every day and never put on make up. It was a really nice change of pace, but did not lend to much blogging or Instagram material. When you're at the lake, there is just no reason to leave! Prior to having our guests, we did manage to get out a bit to hang and watch a live band at the local beach bar. 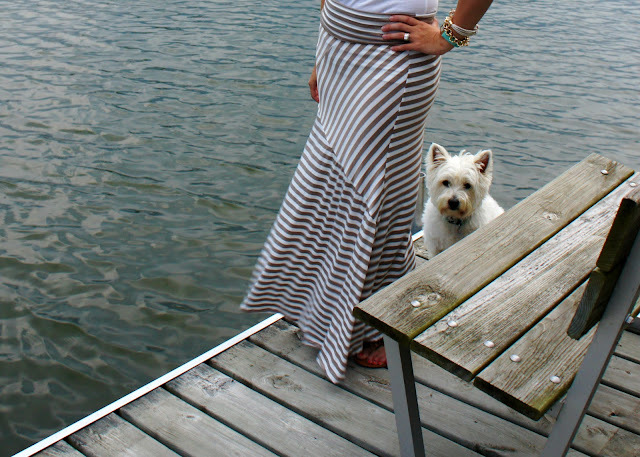 I went for the casual chic look for our night out: neutral maxi, white tee, sandals, beachy accessories and wavy hair. My favorite part of this outfit is the nautical wrap bracelet from Max & Chloe. It is the perfect summer (and lake house) accessory. Let's be honest, we're all obsessed with everything nautical these days - myself included! 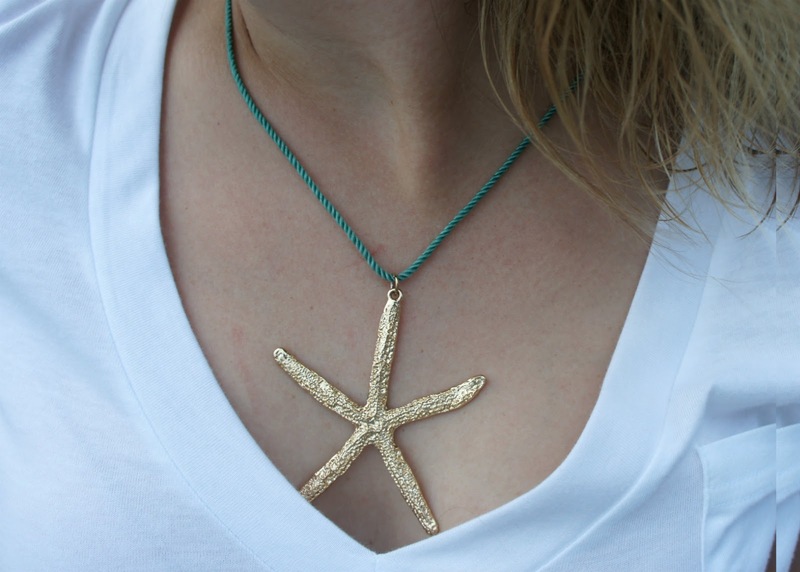 Max & Chloe has a ton of nautical options in their huge selection of fashion jewelry. I love that this bracelet is ivory and can be paired with any color combination. It will definitely be on repeat this summer. And because I love it so much, Max & Chloe wants to give one away! One lucky reader will win this nautical wrap bracelet in her choice of ivory, red or navy! To enter, use the the Rafflecopter at the bottom of the post! Have you ever shopped with Max & Chloe before? 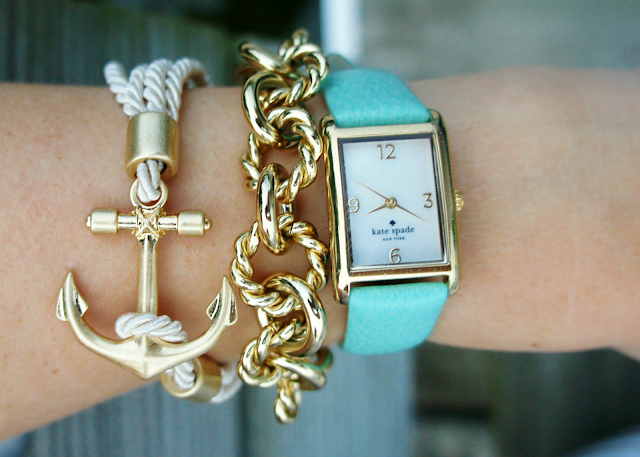 How would you style the nautical wrap bracelet?